Mark IV 22/45 is the classic semiauto target pistol design in 22 LR caliber with a 5 1/2' barrel. 10 round magazine and adjustable front sights. Grab a Mark IV 22/45, some extra magazines and don't forget to grab some ammo with fixed rate shipping. Happy shooting. I've been looking for this pistol for a while, and this seems to be the lowest price. Great gun manufacturer, beautiful design, good all around gun. I gave my S&W 22 LR pistol to my grandson about 2 years ago We all went to Knippa, Tx over the week end to visit. The 3,000 acre ranch has large grain barns and they are full of RATS. My grandson was laughing at me because he has my 22LR......... I had nothing. Bought this for my husband for target shooting. Good price and good reviews! I have been wanting one for a while and the price was great, plus i don't have enough guns! To replace my old trusty Mark I, which has run into problems stripping bullets from the magazines. Also for the easy take down - so much easier than the first generation. Excellent price and great platform to build upon. My daughter shoots in the Plateau Pistol Shooters. Was recommended by a knowledgeable friend as a great first gun due to reliability and ease of use. Great price also. Great price. Hate the MK III. what I was looking for at a great price!! Best performing. looking and now functional .22lr for the money. 2nd and 3rd choice is Browning Buckmark and Smith & Wesson Victory. The price and I have always liked this gun. Reliable and easy to clean in the Mark IV configuration. Great deal on a firearm with a great reputation. Good Quality and cheap enough to get the job done. Did not want something that was a product to take special care of everyday. Farm use mostly. 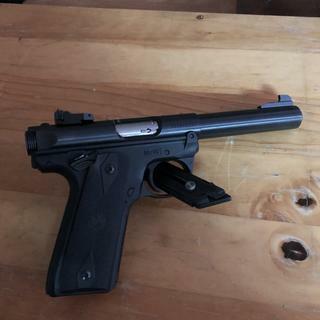 Looking for a good plinking 22LR pistol and something that was easy to let a beginner shoot. Ruger Mark IV has a great reputation and Grab A Gun has fantastic service. Great price on the gun and Grab A Gun always has very fast delivery. Looking for a fun pinker. Like that it’s contoured like a 1911. Liked that Ruger improved the ease of field stripping. 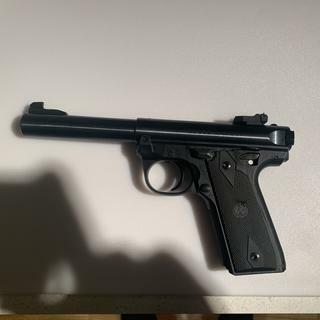 Also considered the Browning Buckmark, but was swayed to the Ruger because I didn’t like that the Browning action opens on “both” sides of the receiver. Felt the Ruger would be more robust in the field. Low cost range gun with easy break down, and proven track record. I wanted a good beginner gun for my wife and 8 year old son to learn and practice with before moving on to a larger caliber. 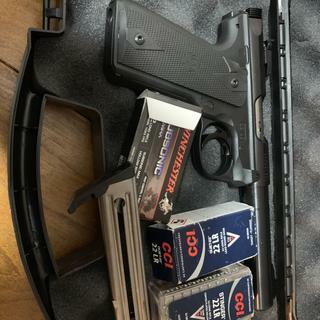 Great price...great gun...sold my old Ruger Mark and regretted it ever since...this gets me back to where I was plus the bull barrel. Can't wait to get it to the range! Price and quality of gun. Great price and recommended by a friend. Always loved the Mark IV, was just waiting for a good price to buy one. Shot one of these at the local range with my daughter. Accurate, stable, economical for plinking and getting a newbie introduced to shooting. Fun gun. Plinking and practice with no recoil. supposed to be a good gun. Grab A Gun had the best price on a high quality target pistol. Price and brand reputation. I have other Ruger firearms. Can you add a top picatini rail on this one? BEST ANSWER: Yes. Ruger makes a picatinny rail for the 22/45 that is only $15 and fits perfectly. There are 3 tapped screws on the receiver that should work fine. I mounted a rail and 3x scope in my Mk 2 for hunting. Will shoot quarter size ragged holes at 25 yards with cheap ammo. Have fun! All 4 of the MK series are capable of mounting a scope. MK 1 & 2 have fixed sights, no mounting hole. Yes. There are several manufacturers of them. There's this new fangled thing out there called "Google",,,,give it a try. Yes, it has been drilled and tapped for one. BEST ANSWER: this gun should be 50 state legal, but with California being the state it is in ,it is almost impossible to what is legal and isn't. i believe there is a web-site in california that will tell you the correct answer. good luck with it, they are fine little pistols. I would think so, it does not have a threaded barrel and a maximum magazine capacity of 10 rounds. However, Cal. State and local laws and ordinances are always moving toward ‘no gun allowed’ so google your current state and local specifications to be sure. How many mags come with this gun? Would recommend for anyone not looking for traditional target grips! Very nice and a good selection. Has performed flawlessly from the first magazine. Pleased with the accuracy. Only thing that I wasn’t a fan of was the front sight. I replaced it with a Hi-Viz. I added a rail and reflex sight Dead on at 25 feet. I use this pistol to teach my grand children gun safety and how much fun it is to shoot before they graduate to my 1911 45. Rusher Mark pistols have always been awesome, but now a push button takedown makes it perfect. Great gun! Shoots well. I've run a lot ammo brands through it (cci, winchester, remington, armscor, aguila) and no problems. 4 stars because it is a bit heavy and the grip checkering is aggressive. Love grabagun. 5 stars for their quick shipping. The grip angle is perfect, the barrel is just heavy enough, and takedown is very easy. No failures to feed in 300+ rounds. Order the Ultimate Cliploader UCL22 to load the mags and you can shoot all day with no sore thumbs. This isnt the tactical model that has rails and threaded barrel but for the plinking I do is perfectly fine. Its very accurate, I can hit a 12 inch steel target at 30 yards no problem. Bought this pistol for my son. Went with him when he first shot it. At 25 feet, grouped the size of a dime. But, the sites were way off to the left. After several adjustments he got it on and it shoots exceptionally well. A bit too much over travel on the reset, but otherwise great. Alwaus loved the 22/45 in all it's former models. The only negative was cleaning and reassembling. This model is a dream come true. No more expletives required. Now it's just the fun of having a great 22 auto for a reasonable price. I had a Ruger Mk III a number of years ago. It was a very nice extremely accurate and reliable pistol. The only problem is that it was a nightmare to field strip. Fast forward to 2019. I found myself needing a good relatively low cost 22 cal target pistol for the NRA pistol classes I am conducting. 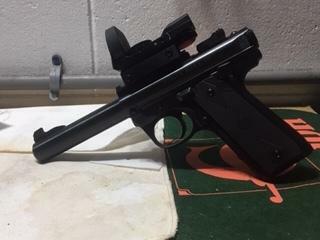 I found out that Ruger had come out with the MK IV. It was supposed to be every bit as tight a pistol as the old MK III but MUCH easier to field strip. I shopped around and found the prices at GrabAgun were dramatically lower than anywhere else I could find. I ordered it, it came into my favorite gun store 2 days later, exactly what they told me would happen. The pistol is every bit as good as advertised, and GrabAGun was the very rare combination of a great price and excellent service. I WILL buy from them again. Uncomplicated process of ordering and shipping to a valid gun store near me. I searched the internet and GrabAGun had the cheapest price. That was good enough for me. Now that I've gone to the range a bunch of times, I could not be more pleased with the purchase. Simple gun to take apart and clean. Mark 4 is the way to go! No one does it better!!!! Ease of ordering online mixed with great customer service and speedy delivery. Not to mention prices that are unmatched. GrabAGun can't be beat!! Had never used grab a gun. I definitely will again, cheapest around and I had the gun at my ffl not 24 hrs later. As far as the gun itself goes I like that a lot. I’m very pleased with the quality and accuracy after about 500 rounds down range. I did have my front sight loosen up which I had been told that they have a tendency to do so. I would put loctite on the screw right out of the box and solve that problem. Very very happy with my experience with grab a gun and I’m about to order a new glock through them as well. This little .22 is rock solid and a joy to shoot. Good weight, well balanced, and decent trigger. Glad I picked up the 22/45 that has the classic 1911 grip. GrabAGun even through in a new T-shirt! Very accurate and feeds different types of ammo. Great price, good build and good accuracy. Hasn’t misfired in the 200+ rounds I’ve put through it so far. Have shot 200 rounds. Had 2 misfires. Could have been the ammo. Really like the feel of the gun. Cleaning is a breeze. The stock trigger setup was clean, but very heavy. I shot 2" groups and 22 yards (the length of my range) despite the trigger. I installed a Volquartsen trigger enhancement and WOW, what a difference. The trigger went from about 8# to 2.5#. I haven't tried it at the range yet, but will soon. Great gun, unbelievable price. I won’t buy my guns anywhere else!!! I got the mark iv 22/45 as a fun plinker , it does not disappoint , very accurate and lots of fun , after 150 rounds I’ve had zero malfunctions . Gun is very accurate. Easy to clean. Love it! Wonderful pistol. Super happy with purchase. One of the top pistols for trainig and pliinking.It has worked flawlessly withh all types of ammo. Just a quick look over at the FFL. It's setting under the Christmas tree. Will let you know more later. Great grabagun.com price and super-fast order fulfillment and delivery to my FFL. But … a bit disappointed with Ruger. The Mark IV's front sight came loose like a swivel after shooting just 140 rds. of CCI 40-gr. ammo thru it. Fixed it myself though after I got home from the range. A fun, high quality gun. I agonized for months over which 22 to get for family shooting. The Walther, M&P, SR22, MarkIV Lite? I was about to order an SR22 when I saw the price on the basic Mark IV 22/45 I ordered it. I had rented a Mark IV and a Lite in the past and honestly I didn't love shooting them but I needed a 22 to help my daughter shoot better and I knew this would be a good gun. When I held the gun for the first time I was surprised at how well constructed it was at this price. It feels solid even with the polymer frame. The 1911 style grip feels familiar. The first range session had me running more rounds through the gun than I expected. My friend who is a fan of Sig, Beretta, and Smith and Wesson revolvers also kept picking it up and shooting and remarked at the feeling of quality in the gun. I have to agree, this gun seems like it will out last the other sub $400 guns on my list. The adjustable sights were right on out of the box. The sights are good but I will probably install a fiber optic front blade. Great Price. Great Purchase. I will buy again. I went to Cabelas and priced this pistol and.went home to find it online at Grab A Gun for nearly half the price. I was so satisfied with the whole.pirchase and speedy shipping. I am waiting for another item to come back in stock, so I can purchase it from Grab A Gun. I will be making future purchses. Can't beat this Gun for target shooting. Very accurate right out of the box and very reasonably priced . Great target pistol, put 300rds through it ,all is good ! Very, very pleased with this model and the price wasn't bad either. Takedown is light years above the others. I did do some small changes, trigger front sight and polish internals. Very pleased. Excellent transaction, great communication, fast delivery. A+ company. Wish all of my online purchases could be like this one. Nice gun. Got it for my mom who has arthritis and it very easy to operate for her. Only needed a fiber optic front sight and she was set. Just what I expected from Ruger nice fit and finish . Can't wait to get on the range with it. Great Gun at a very reasonable price. I added a HiViz front sight. The gu is very accurate out of the box.Write your review here. It must be at least 20 characters long. Consider whether you would recommend this product and what you like about it. Love the 1911 style grip. Great quality and fun to shoot. I changed the sights and it is rockin now. So easy to breakdown. Bought this pistol to supplement my 1911s. 22lr is so much cheaper which translates to more trigger presses. The trigger is only so-so, but i use that as a training aid for my striker fired pistols. I have installed a Volquartsen trigger in my other ruger 22lr pistols, and those triggers are fantastic. So if you want to improve the trigger with an after market kit, it is easy to do so. Awesome gun. Added a Hogue grip to complete the package. Extremely accurate right out of the box. Very solid gun. Super easy take down. I see no reason why this gun (with proper care of course) wouldn't last a few lifetimes. Highly recommend. Excellent gun. Very accurate and easy to shoot. Break down and cleaning are easy. If you’re looking at buying one. Just do it. Great operating firearm. Very accurate out of the box. Fed it all types of ammo and it ate it all. No jams no failures to feed. Easy to break down and clean. Only thing I would add is some colored front sights. And put some locktite on the front sight screw. Mine can loose and the sight post rotated after about 350 rounds. About 1000 rounds through this one. Very nice pistol, no issues. Grabagun shipped almost immediately. Ruger's Mark IV features a simple, one-button takedown for quick and easy field-stripping and proper chamber to muzzle cleaning. The recessed button in the back of the frame allows the upper receiver to tilt up and off of the grip frame without the use of tools. Its internal cylindrical bolt construction ensures permanent sight to barrel alignment, while the contoured ejection port and easy-to-grasp bolt ears allow for durable and reliable operation. The accurate sighting system features a drilled and tapped receiver for Weaver- or Picatinny-style rail. The Mark IV is a single action and utilizes an ambidextrous manual safety, push-button magazine release located on the left side, and an ergonomic bolt stop. Included is a washer and two magazines. This 22/45 model features a 5.5" bull barrel, polymer grip frame, blued metal finish, black synthetic grip, and a fixed front sight with an adjustable rear. Watch this video to see the features, specs, options and variations of the Ruger Mark IV line of 22 pistols.